I have been at a standstill for words to share and waiting to hear what eventually will emerge. Sometimes the creative juices aren’t flowing with new insights. However, as I reflected on what I want to share, I am aware of something I have been experiencing. Many of us, including myself, grew up with a society and parents that value physical attractiveness. This standard can be quite difficult to live up to. 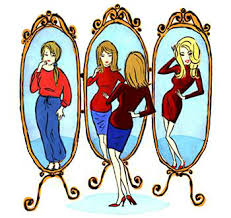 We may on a continual treadmill to focus on looking more and more appealing for others. We all feel pressure from the media. It can literally shape how we view ourselves and influence our life. We may grow up learning that to wear the right clothes and focus on outward looks is how we get our value. We may feel that if we are attractive enough we will be loved by others. It can keep us bound up and unable to fully move out into the world with whatever destiny God has for us. What I have been experiencing lately is when I look into the eyes of others I see the true beauty and essence that they radiate. It’s so freeing to be able to gaze at their face without the physical judgments that we tend to view others with. I’m aware there is no one that doesn’t exhibit beauty since we are all handcrafted by God. It seems we have to get past the way we have been conditioned to look at others based on societal views of attractiveness. A few weeks ago I was doing a little physical cleansing and I broke out in an eczema rash around both eyes and one was really red and swollen. My lips were so dried that when I smiled it hurt. I had to go through my day accepting that my appearance wasn’t up to par and still feeling good about myself. I learned through this experience to let go each day of putting so much value and consciousness on my looks. I felt like this was an area that God was working on to wean me away from the feeling of not feeling attractive enough. By being able to see the beauty in others essence it helped to be able to turn the mirror to myself. So think about whether you are controlled by other’s opinions, judgments, or standards. It can literally rob us of the confidence to move out into our purpose. Gradually as you learn to focus more and more on the presence of God and His love for you, you will less and less focused on how you appear to others.